There’s a reason why showbiz types say ‘never work with children or animals’. It’s because they’re unpredictable, and that’s also a good reason why you need to be extra careful if you’re travelling with them. Breaking down is a situation nobody wants to find themselves in, but if your horsebox breaks down with a horse or two in the mix, you have a recipe for even greater stress levels. To make matters worse, although your breakdown cover may extend to having an engineer come out to fix your vehicle at the roadside, it won’t cover bringing you and your animals home if a fix isn’t possible. Here’s what to do if you’re caught in this unlucky situation. As always, prevention is better than cure. Whether you tow a horsebox or drive a horse lorry, keeping your vehicle or box well maintained will help reduce the likelihood of anything going wrong. Whether your horse is generally a happy traveller or not, a long wait for roadside assistance – and then potentially noisy roadside repairs – could prove unsettling for them. Always carry food and water with you, for both you and your horse, along with human and equine first aid kits. Pack a bridle and extra lunge line in case you need to let your horse stretch its legs (only if you’ve broken down in a safe, rural spot), and make sure you’re equipped for the weather: a sponge and bucket to cool off your horse in hot weather, and a warm rug for cold conditions. Save emergency numbers in your phone, including your breakdown cover, insurance company and vet, and don’t forget to carry a car phone charger with you so that your phone won’t run out of battery when you’re on the move. While you won’t always have a choice about where to stop, try to move as far over to the left as you can, or ideally into a layby or quiet side road. Switch on your hazard lights and get out of the vehicle yourself, leaving by the doors on the side away from the traffic. Wear the reflective vest you take riding with you, to keep yourself as visible as possible. If you’re on the motorway and you could pose a danger to traffic, call the Police or Highways Agency on 999 or 112. It’s natural to feel panicky when something like this happens, but try to remain calm; your horse can pick up on your anxiety and may also start to panic. 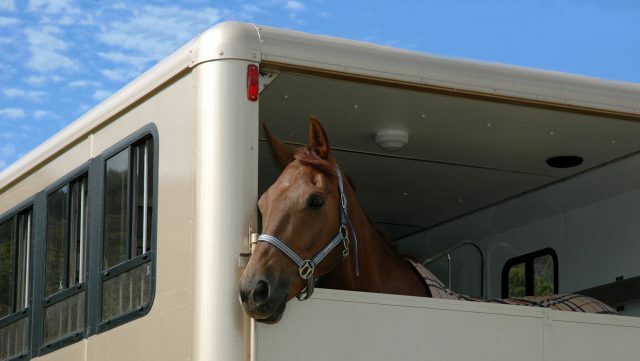 Make sure they have fresh air in the horsebox or lorry, but don’t let them out of the vehicle or box if you can avoid it. For peace of mind when you’re travelling with your horse, take a look at our specialist horsebox insurance.